Corn has joined the list of popular alternatives to fossil fuels. Its high heat value, ease of handling, and ready availability in some sections of the United States have growers looking for information on cost, handling, and equipment suppliers. Although burning corn isn’t for everyone, a grower that is close to a good supply may find that it can reduce heating costs significantly. Penn State Cooperative Extension has a Corn Energy Equivalent Table and an Energy Selector tool that you can use for easy comparison of corn to other types of heating fuel. Fuel and corn prices fluctuate greatly, so check current local prices to make a comparison for your situation. Corn weighs 56 pounds/bushel. One bushel is 1.25 sq ft.
Corn has a heat value of about 7,000 Btu/lb or 300,000 Btu/bu, when dried to 15% moisture content. Assuming a furnace or boiler efficiency of 75%, one bushel of corn is equal to 2.9 gallons of No. 2 fuel oil, 4 ccf (100 cubic feet) of natural gas or 4.4 gallons of propane. How much shell corn you will need depends on the size of your greenhouse, where your operation is located, weather conditions, the desired night temperature in the greenhouse and the efficiency of the furnace or boiler. A 200,000 Btu/hour corn furnace will provide heat for a 25′ x 96′ double-poly greenhouse in all except the northern tier states, and will burn about 1/2 bushel of corn per hour. To replace a known quantity of fossil fuel with corn you can use the following formulas. These are based on an average fuel use efficiency (AFUE) of 75%. Multiply no. gallons of No. 2 fuel oil by 0.345 to get bushels of corn. Because corn is drier, there is less smoke from corn than from wood. There is also less ash: 1% compared to about 2% for wood and 5 to 10% for coal. Corn ash has some fertilizer and lime value. Corn, when burned, tends to produce a hard, glassy slag that can coat the inside of the burner. It also produces hard chunks of silicon dioxide (clinkers) that need to be removed; otherwise, they will block the fire. With bottom-feed systems, the clinckers are pushed up with the ash as the shell corn is moved in underneath; in top-feed systems clinkers have to be removed manually on a regular basis. Adding crushed oyster shells will reduce the formation of clinkers. Shell corn is available from elevators, feed mills or directly from the farm. If you have extra land available, consider growing it yourself or having a local farmer grow it for you. A 20,000 sq ft gutter-connected greenhouse used 27,600 therms of natural gas last year. To replace the natural gas with shell corn: 27,600 therms x 0.26 bu/ccf = 6,900 bu corn. To get the number of acres: 6,900 bu ÷ 160 bu/ac = 43.1 ac. Corn should be clean – pieces of husk, stalk, cobs, broken corn, stones, and soil can cause problems with both the feed mechanism and burner. You should specify a No. 2 grade of corn. No. 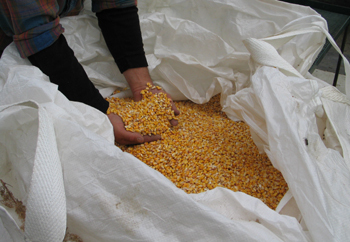 2 corn has a lower quality than more costly No.1 corn but will usually work fine in most heating plants. If you are purchasing corn directly from the field, you can clean it yourself with a corn cleaner. To burn efficiently in most heating systems and to maintain quality during storage, corn must be dried to a moisture content of 15% or less. HIgher moisture contents will result in mold and fungus growth that can plug augers and bins. For each 1% increase in moisture content, the heat value is reduced 90 Btu/lb as a result of the energy needed to evaporate the extra water. The corn must be in a dry environment so that it can be handled freely. Bins, tanks, trailers, and buildings are commonly used for storage. One bushel requires 1.25 sq ft of storage space. 100 lbs requires 2.25 sq ft. If all of the 6,900 bu corn needed in the above example were to be stored before the heating season, it would require a building with 7,040 cu ft or a space of 20′ wide x 44′ long x 8′ high. To operate properly, the furnace or boiler has to be designed to burn corn. It usually has a storage hopper that is filled by hand or conveyor, depending on the size of the unit. For example, a 200,000 Btu/hr furnace may have a 12- to 20-bu bin, enough to provide heat for 24 hours or more. The corn is fed to the firebox with an auger or other conveying device. This is powered by a variable speed gearmotor that adjusts the rate of feed and therefore the rate of firing. A blower or compressor provides the oxygen needed for combustion. Air must flow through the pile to keep the fire burning. Ashes are usually pushed over the edge of the firebox to an ashpan. Flue gases are removed with either an insulated stainless steel pipe or if the unit is designed to remove the condensate heat, a PVC pipe may be used. Most units have either a pilot light or ignition system. The manufacturer’s instructions should be followed in both the installation and operation. 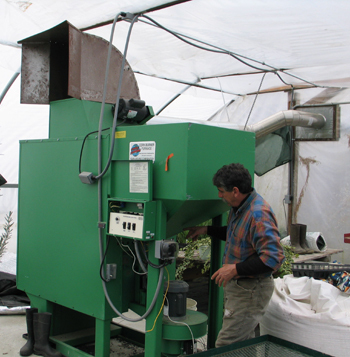 Many units made for corn will also burn wood pellets, wheat, rye, or other grains. Most of the corn burner manufacturers make stoves for the residential market. 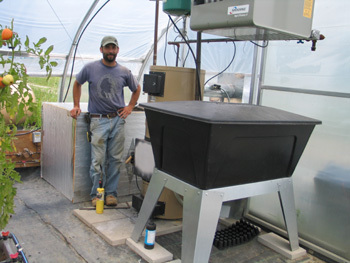 There are a limited number that make units large enough for greenhouse use. Burning Shelled Corn – A Renewable Fuel. Penn State Cooperative Extension. Includes Heat Energy of Shelled Corn, Corn Energy Equivalents, Energy Cost Comparison Chart, Questions to ask when purchasing a corn burner, Shelled Corn info. Tables for Weights and Measurement: Crops. University of Missouri Extension. Corn and Biomass Stoves. North Dakota State University publication.